Alma Claude Burlton Cull (1880-1931). Watercolour signed and dated 1920. Although this watercolour is dated by the artist 1920, certain features here clearly show he has painted the battleship as she was betwen 1917-1918 when she was the Grand Fleet flagship of Admiral Sir David Beatty. The Carley lifefloat on the side of X turret (removed by early 1918) is perhaps the easiest feature to spot and the lack of the 9 foot rangefinder on the roof of the fore spotting top and a mainmast gaff that springs from the starfish (it was re-sited to a slightly lower position, below the starfish, sometime in 1918) are another two. This is a beautifully painted watercolour with a wealth of fine detail on the battleship and on the motor launch in the foreground too. 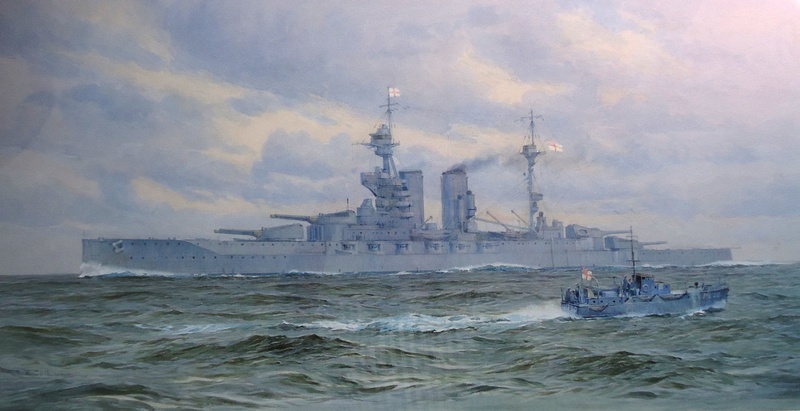 Cull has chosen this time not to include an exotic sky or a dramatic sea, perhaps because he wished to emphasise that this was just another ordinary day of routine patrols and unexciting sea time for QUEEN ELIZABETH and the rest of the Grand Fleet as they awaited their chances against the High Seas Fleet which, since Jutland in May 1916, had been increasingly reluctant to venture into the North Sea. For His Majesty's ML20 in the foreground too, it seems that despite the 30,000 ton bulk of the Fleet Flagship passing close down their port side, this was nothing but routine: her small ship's company appear to be little interested in QE and apart from one hand who is looking out at her, the remainder of those on the upper deck in the stern sheets and in the bridge are just getting on with their day - although they will shortly be rolling heavily in the wash created by the dreadnought. We must assume that they have already paid their respects to the C-in-C by piping him as the ships passed each other ("attention on the upper deck, face to port; the Commander-in-Chief Grand Fleet") but they do seem unusually relaxed in the close proximity of two such big beasts, admiral and battleship! HMS QUEEN ELIZABETH was a much painted warship of the time (both Cull and Frank Watson Wood were clearly very taken with her beautiful lines) and along with IRON DUKE and WARSPITE she appears more often in paintings of those years than any other warship. Commanded at this time by Captain A E M Chatfield CB CVO CMG who had come from being Beatty's flag captain in the then Grand Fleet Flagship, IRON DUKE, when Beatty shifted the flag to QUEEN ELIZABETH in late 1916, QE and her 4 sisters were at their most attractive during this, their "as completed" appearance. Trunked funnels followed in the 1920s and for most of the class, a rebuild in the 1930s produced ships that whilst not unattractive, lacked the imposing symmetry of the twin funnels as painted here by Cull.